Cullmann's 6-Piece FLEXX Touring Set gives you a wide range of ways of supporting your camera, in a compact, lightweight kit. The compact Nanomax 400T tripod supports up to 5.5 lbs (2.5 kg) and rises to a height of 2.84' (86.5 cm), while folding down to just 11.8" (30 cm). The aluminum ballhead has a 360° rotatable locking lever that allows for quick and easy locking. Need to fasten your camera to a smooth surface (like glass)? The suction pod in this kit will do the trick. A rigid aluminum multi-clamp with four different 1/4" connection threads gives you an ideal way to mount your camera in any number of situations, indoors or out. The included anodized aluminum earth spike, combined with the camera plate and the ballhead, is ideal for the nature photographer. 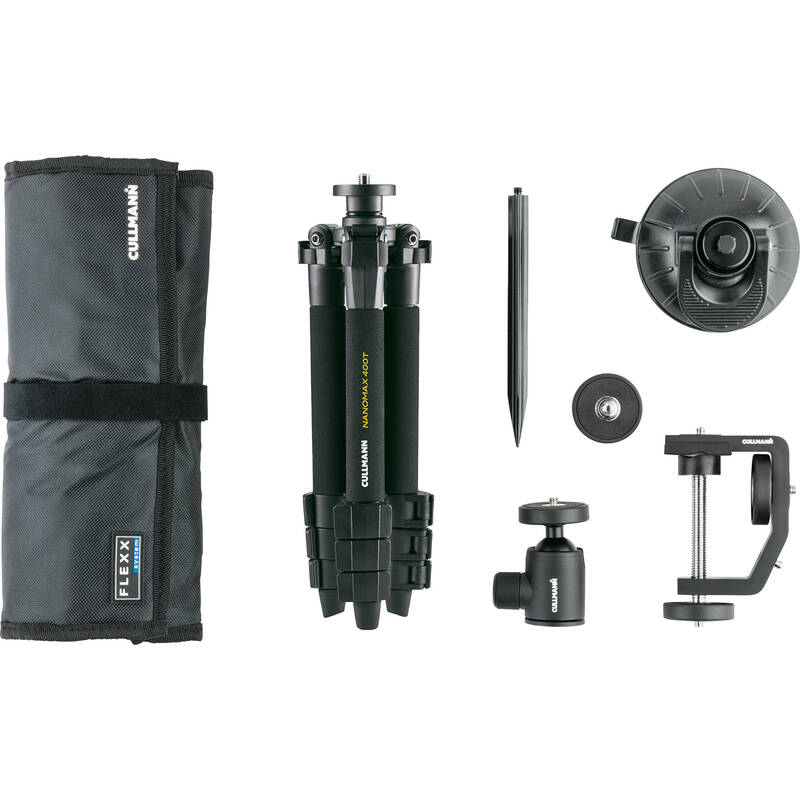 The compact tripod NANOMAX 400T is especially designed for photographers who like to travel with a backpack. Everything can be safely stored in the high-quality transport bag designed for the contents of the FLEXX Touring Set. Box Dimensions (LxWxH) 14.5 x 13.3 x 3.2"
6-Piece FLEXX Touring Set is rated 5.0 out of 5 by 1. Rated 5 out of 5 by Achiu from Best portable small tripod for photo & video ! Handy & comfortable size tripod of very good quality designed in Germany ,with medium height and lightweight for every day uses, with accessories for bicycle/car on the road ,macro shots and for travel of course. For video shooting ,you need a video head indeed ! In short, it is an excellent well thought design ! Only the carrying bag is not for carrying ,too small to put all the tools inside but for luggage storage use .